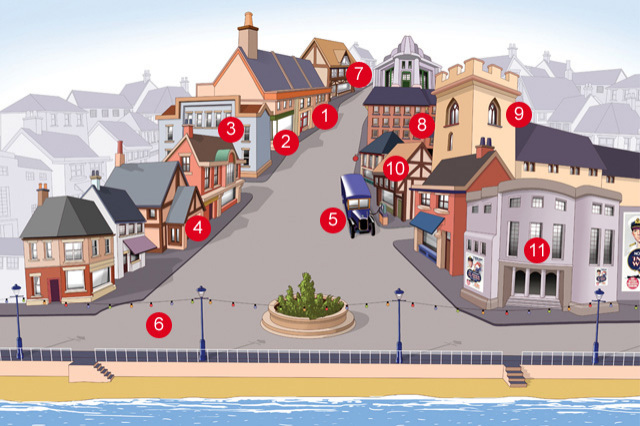 Ever wondered how Walmington-on-Sea would look now? A while ago we imagined how the town might be in the immediate post-war years and brought those to you in the Post-war Diaries of George Mainwaring. However, James Hayes of Engineering and Technology Magazine has bigger ambitions and has brought us a re-imagining of how the town might look today. As you’d imagine from the Institution of Engineering and Technology (who publish the magazine) he focuses on how advances in technology would change the town. So what does he predict for the town? Does the pier still have a gap in the middle, or is it renewed and repaired? Has the current manager of the bank been caught out manipulating LIBOR? Is there a modern Warden Hodges slapping tickets on BMWs parked too long on the front? You’ll have to read the article to find out. While you are there, check out the rather nice 3D map which shows the town as it now might be – watch-out though, it is a big download. This entry was posted in blog on August 25, 2012 by wolAdmin. I would love to see the 3d map but the link doesn’t go anywhere now. Does anyone have a link or download they could point me at? Well spotted! Fortunately there is an archive of the article at the link below (have also changed the link in the text above) and you can access the map from there. Thanks, and enjoy,.